The College Opportunity Fund (COF) is a state stipend for Colorado residents. This is considered the state portion of your tuition. The COF stipend will lower your tuition bill by $85 per credit. You must be classified as a Colorado resident for tuition purposes and complete the COF process. COF is a two-step process. Apply for COF – Sign up here! *It will take 3-4 business days for the COF stipend to appear on your tuition bill once you have completed the COF process and registered for classes. Please be sure to complete this process and review the tuition table and your tuition bill each semester to ensure you are being charged the correct amount. If you go over this amount, you have options! * Please be sure to include the total credits you need for three consecutive semesters. Once the number of credits has been added into your student account, we cannot add any additional credits. If you do not use the credits requested within the timeframe specified, they will not carry over for additional semesters. If requiring that an eligible undergraduate student pay the full amount of total in-state tuition for credit hours that exceed the limitation causes substantial economic hardship for the student or the student's family. Please contact the COF Advisor to see which waiver you are eligible for and to start the process (Lisa Rogers; 303.914.6358). At which colleges can I receive the College Opportunity Fund stipend credit? How do I apply for the College Opportunity Fund Stipend? How old do I have to be to apply for the College Opportunity Fund? How does my college know that I have applied for the stipend? I've completed the Stipend Application -- is there anything else I have to do? How does the Stipend get sent to my college? I am transferring from one college to another. How do I transfer my College Opportunity Fund account to my new college? If I take classes at more than one college during a semester can I receive COF at both colleges? Will the College Opportunity Fund pay for all of my courses? I am a transfer student, am I eligible for the College Opportunity Fund? Will the stipend pay for all of my in-state tuition? How much is the College Opportunity Fund stipend worth? What if I go over the cap (145) hours, who should I talk with and what is the process? How is the College Opportunity Fund different from state funding prior to July 2005? Does the College Opportunity Fund replace financial aid? Will the College Opportunity Fund affect financial aid? Will a check be sent to me? Why do I have hours reported as used against my Stipend Account if the College Opportunity Fund did not begin until July 2005? The College Opportunity Fund (COF), created by the Colorado Legislature, provides a stipend to eligible undergraduate students. The stipend pays a portion of your total in-state tuition when you attend a participating college. Eligible undergraduate students must apply, be admitted and enroll in classes at a participating college to receive this benefit. Both new and continuing students are eligible for the stipend. Qualifying students may use the stipend for eligible undergraduate classes. The stipend is paid on a per credit hour basis directly to the college at which the student is enrolled. The credit-hour amount is set annually by the General Assembly. "Stipend" means the amount of money per credit hour paid by the state of Colorado on behalf of an eligible undergraduate student who is attending a participating college in the state of Colorado. The specified amount of the stipend per credit hour is set annually by the Colorado General Assembly. The amount will never exceed the student's total in-state tuition. The value of the per credit hour stipend will be the same for each eligible undergraduate student attending a participating state college. If an eligible undergraduate student attends a participating private college in the state of Colorado, the per credit hour amount is fifty percent (50%) of the annually set stipend amount. Total stipend hours per student, per semester, are reported to the College Opportunity Fund (COF) by the college you are attending. COF matches the student information provided by the college with Stipend Application Account information in its database (the information you provided when you created your stipend account) and disburses the stipend amount requested directly to the college. Eligibility is determined by the type of college you attend. Undergraduate students enrolled at public colleges are eligible if they are classified as in-state students for tuition purposes. This is determined by the college. You apply for the stipend by completing the online Stipend Application here or the paper application by emailing COF@rrcc.edu and requesting an application. When you complete the stipend application you create an account that is accessible to you. The college you attend will access this account information when it requests payment on your behalf. No. You only apply once. When you complete the stipend application you create an account with 145 available undergraduate hours. You can apply the stipend funding for these hours at any participating college in the state of Colorado if you meet the eligibility requirements. You can apply for the College Opportunity Fund if you are thirteen years or older. If you are under the age of 13 and wish to enroll in a college class you are still eligible to receive the stipend if you meet the eligibility requirements, but you must contact the COF advisor at COF@rrcc.edu or 303.914.6358. RRCC sends COF a file containing the names of students who are enrolled each semester. The COF system will process this file and return it to the college. This file will let the college know which students have COF accounts and which students still need to apply and/or authorize their account and if you have enough COF credits. If you have a COF account and the personal information you provided to the college is the same as you used to create your account and you have authorized COF at RRCC, the stipend will be approved for payment at your college. Completing the Stipend Application is all you need to do to apply for the Stipend. You will also have to authorize RRCC to send this request for payment on your behalf. 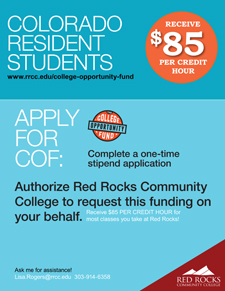 RRCC will let COF know you are enrolled and the number of eligible stipend credit hours you are taking each term. COF will send the stipend amount on your behalf to RRCC to apply against your total in-state tuition charges each term. You will see the College Opportunity Fund Stipend credited against your total in-state tuition charge on your bill. You authorize your college to request the stipend funding on your behalf from your COF stipend account. This authorization step is completed when you register for your classes and is part of the registration process. If you have registered for classes but do not know if you have authorized the college to request your COF stipend, contact the COF advisor at COF@rrcc.edu or 303.914.6358. Many colleges give you the option to select a “lifetime” option. If you choose the “lifetime” option you will not need to authorize RRCC every term to send a request for payment to COF. However, if you transfer colleges or take a class at a different college, the “lifetime” option does not extend to that new college. You will have to authorize each school you attend to bill COF for the classes you take. When you applied for the stipend and created your COF stipend account, you were not asked for any college information. That's because students transfer from one college to another, or take classes at more than one college during a semester. You can use your stipend funding as long as you are enrolled in a Colorado public or private college that is participating in the stipend program and meet the eligibility requirements. When you register for your classes you authorize your college to request the stipend funding on your behalf. Your authorization is the trigger for your new college to request the funding from your COF stipend account. Yes. As long as the college is participating in this state funding program, you meet the eligibility requirements, you have authorized the college to bill COF, and you have unused COF credits remaining on your account. Off-campus, extended campus, or continuing education classes not supported by state general fund moneys, except as approved by CCHE. If you are an undergraduate student transferring from an out of state college to a participating college in the state of Colorado and meet the eligibility requirements for that college you are eligible for the College Opportunity Fund. No, the stipend only covers the amount set each year by the Colorado Legislature. You still must pay the remainder of in-state tuition (the student’s share). Please review the tuition table for details. Your tuition bill will show the total in-state tuition, the amount paid by COF (the state's share) and the portion for which you are personally responsible (the student's share). You will pay the total in-state tuition minus the portion paid by the College Opportunity Fund, minus any financial aid you receive. The amount for academic year 2013-2014 has been set at $85 per semester credit hour for eligible students attending participating public colleges and $37 per semester credit hour for eligible students attending participating private colleges. The new stipend amount will begin with the Fall 2013 semester and remain the same through Summer 2014 for students who attend a semester based college or from Quarter 1 2013 through Quarter 4 2014 for students who attend a college on a quarter hour based system. The law that created the College Opportunity Fund caps a student's eligibility for this state funding at 145 credit hours. However, there are exceptions and waivers that can be granted by the college and by the Colorado Commission on Higher Education (CCHE). Colleges and CCHE have developed policies to inform students about the exceptions and how to apply. In addition, if the student receives a bachelor's degree from an approved college, the student is eligible to receive stipend funding for an additional 30 hours of undergraduate credits. If the student exhausts the 145-hour lifetime-credit-hour cap, the student may be eligible for a waiver. There are three different types of waivers the student may apply for. Please contact the COF Advisor to see which waiver you are eligible for and to start the process (COF@rrcc.edu, 303.914.6358). Public colleges have historically received funding directly from the state of Colorado in the form of a general fund subsidy to educate in-state higher education students based on a full-time-equivalent student formula. This funding method changed beginning July 2005 when the College Opportunity Fund stipend went into effect. The stipend for eligible undergraduate students now goes to the college on behalf of the student and the amount is based on the number of credit hours the student registers for each semester. The College Opportunity Fund is a payment made directly to your college on your behalf to cover part of the cost of your total in-state tuition. The stipend does not cover your share of total in-state tuition. Any financial aid you receive will be applied to your share of in-state tuition. The College Opportunity Fund stipend is not a grant or a scholarship and does not impact your eligibility for student financial aid. The College Opportunity Fund is not a loan and does not have to be repaid. No. COF is not income based or related to financial aid in any way. You qualify for COF based on residency. No, the College Opportunity Fund stipend goes directly to the college or colleges where you are enrolled. The stipend amount will be applied directly to your student account each term in accordance with the amount established for that year and the number of credits you are enrolled. For example, if you are attending a public college for the Summer 2013 semester and are enrolled in 15 credit hours, the stipend amount credited to your total in-state tuition would be $930.00. 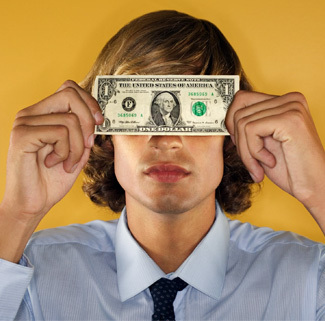 No dollar amounts are available on your Stipend Account at COF. However, you will be able to see how many credit hours of the 145 limit you have used by term, by college, when you log into your COF account. This will help you plan your higher education to best use the stipend credit hours.